Black women are the only group that has not recovered the jobs they lost in the recession. Five years into national recovery, the unemployment rate for Black women has even risen a little since December, from 8.2 percent to 9.2 percent. On the flip side, employment brings its own unique difficulties for Black women, too. 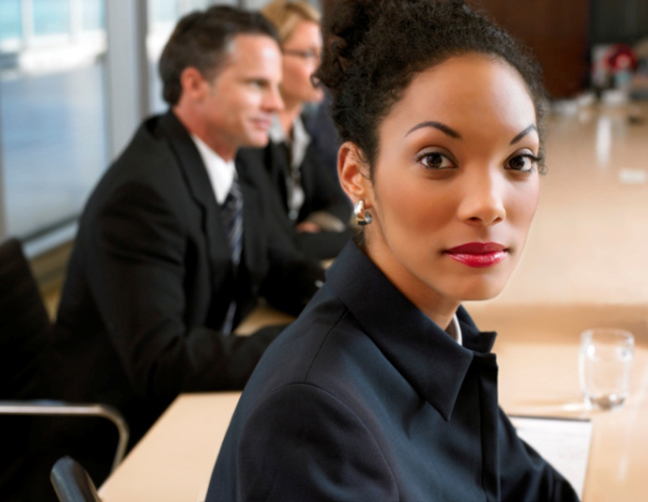 According to a new report commissioned by Essence magazine, 80 percent of Black women surveyed believed that they could not advance in their careers without altering aspects of their identities. Additionally, 57 percent believed that they had to “look a certain way” to be promoted, compared to 39 percent of White women who thought similarly. And while Black women are more optimistic, ambitious, and self-confident in their careers than their White counterparts, they are much more likely to say they are different at home than they are at work. “…[T]he additional hurdle of real or perceived stereotypes complicates the work experience. The conversation around work/life balance for Black women also impacted by the reality of pay inequities and higher levels of unemployment in our communities which may necessitate working multiple jobs to make ends meet,” says Essence editor-in-chief Vanessa K. De Luca. One thing that holds true for Black is the challenge of building wealth. The median wealth, or net worth, among single Black women is just $100; and if they are raising minors they have no wealth at all, according to a recent analysis of data from the federal Survey of Consumer Finances. In fact, nearly half of all households headed by a single Black woman in 2007 had zero or negative wealth. The median wealth among single White women is $41,500 and only climbs as they age. Meanwhile, 1 in 4 Black women over the age of 65 who receives Social Security benefits rely on it as their only source of income. Recession job losses hit Black women especially hard, since most of the downsizing took place in the service and public sectors where Black women are overrepresented. Additionally, wages have stagnated as the cost of living continues to rise, from housing to childcare to education. Even if wages had been growing, the wage gap persists – and not even education can bridge the chasm. Consider: Black women with master’s degrees earn slightly less than Black men with bachelor’s, and White men, Asians, and Latinos with associates or post-secondary degrees, according to data from the 2013 Census Current Population Survey. And even without the gap, wages alone are not enough to build wealth. Alternatively, wealth can be generated through strategic investments, such as land ownership, stock, appreciating valuables (such as wines and collectibles), and even creating or backing successful start-ups. Black people tend to have poor access to these avenues. Wage disparities do not leave much disposable income for these options, and traditional lenders are notoriously predatory and/or discriminatory to Black people seeking funding. A high net worth offers cushion from unexpected emergencies, and allows families to rely less on individual paychecks for financial stability. Because of this, social safety net programs are often the only thing keeping middle- and lower-class Black families from sliding into destitution when living check-to-check fails. As justice movements bubble up around the country, issues affecting Black women are gaining more attention. With recent reports such as “Black Girls Matter: Pushed Out, Overpoliced, and Underprotected”; “Black Women in the United States, 2015”; and “In Our Own Voice: Black Women on Abortion, Contraception and Reproductive Justice,” researchers are laying the tracks for change with conclusive, targeted data.